From this point of view the 2°C guardrail looks hazardous in the extreme. In 2006 Hansen warned that a warming of 2 to 3 degrees above present is likely to give a sea level rise of 25 metres (Climate Code Red, p87). Climate Code Red, by David Spratt and Philip Sutton in 2008, suggests that the 2°C guardrail is the answer to the wrong question. The question was, what is the minimum we need to do to avoid catastrophic climate change? The answer given was 2°C and CO2 concentrations of no more than 450 ppm. The real question should have been, what do we need to do to have a safe climate? Spratt and Sutton think 320 ppm and a temperature back in the Holocene range. in 29 African countries, crop failure and hunger are likely to increase. Without doubt the list is incomplete. I’ve spelt it out in detail, however, to illustrate the knowledge that was commonly available back then, a year before the 192 countries that participate in the UNFCCC decided in Copenhagen to adopt the 2°C guardrail as a desirable aim in December 2009. On the same page Spratt and Sutton quote Hansen as nominating 425 ppm, plus or minus 75, as the tipping point for the total loss of ice sheets on the planet. When approving new pharmaceuticals and designing aircraft, bridges, and large buildings, strict risk standards are applied: a widely used rule of thumb is to keep the risk of mortality to less than one in a million. Spratt and Sutton blame the “political-corporate elite”, whoever they are, for getting us into this mess. A mind-set has certainly been established with considerable inertia. When this mind-set is broken we’ll know that policy makers are serious about saving the planet. See also Spratt’s is climate change already dangerous? You’ll be unsurprised to find that he thinks it is. 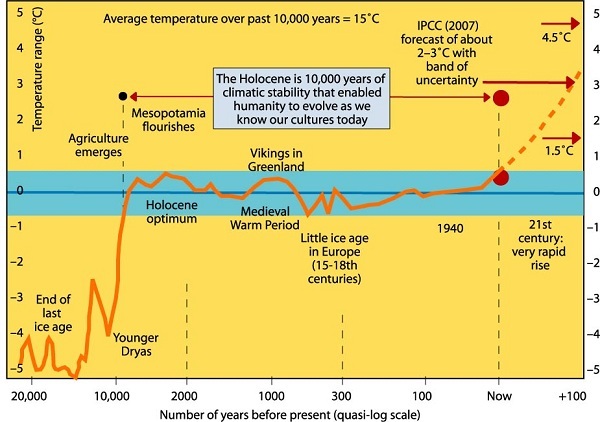 Update: In the post IPCC Synthesis Report: you’ve been told! I asked the question Is a 2°C temperature rise safe? Climate sensitivity and the myth of ‘burnable carbon’. The most optimistic view is that the US, China, EU, India consensus is real and will lead to accelerating climate action. Could be even faster if an economic consensus develops that a war on climate change is the only way to revive the world economy. A less optimistic view is that a hunger driven breakdown of world peace will lead to the dramatic crashes in world population and industrial capacity before too much damage is done.